There aren’t too many online casinos where you can play the games by Greentube (or Novomatic). 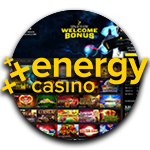 Energy Casino just happens to be one of them, but that certainly isn’t the only reason why you might want to register an account there. They also have many other nice games, as well as a wonderful customer service team, fast withdrawals and a great reputation. Plus of course a safe website with an SSL encryption and all necessary licenses from the MGA and the UKGC. Certain things can be found at pretty much every reliable online casino. This includes the slots and the videoslots that are made by Netent, Quickfire (Microgaming) and Play’n Go. But in some cases, operators have some unique properties which makes them excel from everyone else. For example, Energy Casino offers many famous games which can usually only be found in land-based casinos. That means in addition to all the standard games, they also offer slots by Greentube (Novomatic), Merkur, Bally Wulff, Wazdan, BF Games, Gamomat and UC8! Those are remarkably exclusive and gives Energy Casino a big advantage over everyone else. Because let’s be honest, wouldn’t you like to try your luck on Book of Ra, Sizzling Hot, Plenty on Twenty, Eye of Horus and 40 Thieves from the comfort of your own home? Even if you end up getting bored of online slots, you won’t need to worry, by the way. Because this operator also offers a high quality live casino room, sportsbook options and plenty of online table games on which you can try your luck! Another top quality of this online casino is its withdrawal speed. At Energy you will get your money in only 1-7 hours if you use e-wallets like Neteller or Skrill, while credit/debit cards take 1-2 days and bank transfers take 2-5 days. That might sound like a long time, but those times entirely depend on the processing speed of your own bank. Pending withdrawals are processed in no more than 12 hours (usually less), which is a lot faster than most other websites. You can withdraw up to 5000 euro per day, which is pretty standard, but you will need to verify your account at one point, because of government regulations. Luckily, this process is remarkably smooth at Energy Casino and they are happy to help you out if you have any issues, meaning you won’t have too much of a hassle when you need to get this over and done with. In all fairness, the welcome bonus isn’t all that spectacular. You can claim 100% bonus up to a maximum of 200 euro, which is of course very nice, since they’ll double your first deposit up to a substantial amount, but nothing out of the ordinary. You will however also get to benefit from plenty of interesting promotional offers which will come your way on a regular basis. This includes tournaments, player points which can be saved up, and 10% cashback on your losses in the live casino every single Wednesday. If you want more bonus, or if you have any questions about current promotions at Energy Casino, then you can also contact their highly trained customer support team. They are reachable 24 hours per day and 7 days per week via live chat, email and international phone. And if you’re not too tech savvy, you will even get the option to communicate them via post!